The United States is going through an electric renaissance as the country’s generation portfolio shifts from coal plants to renewable resources. These types of changes, along with changes to how transportation is powered and how energy is supplied, are termed “electrification.” Electrification is the production of an electrical charge and involves changing from one power source to another. Renewable energy, mentioned in Chapters 2.1.5 and 5.5.1, qualifies as electrification. In addition to the sources previously discussed, this Chapter will discuss the electrification of vehicles, energy storage, and microgrids. Hybrid Electric Vehicles (HEVs) have a small on-board electric motor and battery that is recharged by vehicle operation, generally while braking. The batteries in HEVs cannot be recharged externally. Conventional HEVs have been on sale for over 10 years and are fundamentally different from the other types of electric vehicles. A Plug-in Hybrid Electric Vehicle (PHEV) has an internal combustion engine that can take over when the battery runs down. PHEVs have larger batteries than traditional hybrid vehicles, allowing them to be operated in all-electric driving mode for short distances, while the internal combustion engine effectively provides for an unlimited driving range. Toyota makes a PHEV Prius. Battery Electric Vehicles (BEVs) have a battery that can be recharged through an external connection to an electricity source and runs only on the batteries. An example of a BEV is the Nissan Leaf. An Extended-Range Electric Vehicle (ER-EV) is essentially a BEV with a small internal combustion engine, which acts only as a generator to recharge the batteries for longer range. The engine does not power the wheels. An example of an ER-EV is the Chevrolet Volt. Click to OpenElectric Vehicle Charging Stations in MarylandRegardless of whether a consumer owns a BEV, PHEV, or ER-EV, driving habits are expected to remain unchanged, and therefore, battery charging requirements will be similar. The versatility offered by PHEV and ER-EV back-up engines is especially appealing to consumers concerned about the range limitations of all-electric vehicles, making consumer adoption of PHEVs and ER-EVs in significant numbers more likely. Additionally, once “range anxiety,” as it has been termed, is no longer an issue due to the combustion engine back-up, consumers will not need to worry about charging their vehicles while away from home. Therefore, the majority of PEV charging will likely be on residential-level electric distribution systems. In order to assess the environmental benefits of PEVs, it is necessary to compare emissions from electric vehicles to emissions from an internal combustion engine (ICE). When running on electricity, PEVs do not emit any pollutants through the tailpipe exhaust; however, there are emissions associated with the generation of electricity used to power the vehicle, unless of course, all the electricity comes from a clean resource, such as solar or wind. Nonetheless, according to data from the EPA’s Emissions & Generation Resource Integrated Database (eGRID), electricity generation in the region that encompasses Maryland, defined as the ReliabilityFirst Corporation, produces an average of about 516 grams/kWh of carbon dioxide equivalent (CO2e). Therefore, assuming a BEV is driven 12,000 miles per year, which approximates the national average, its expected contribution to annual emissions in Maryland equates to about 2.10 metric tons of CO2e. According to an estimate from EPA, the average internal combustion engine passenger vehicle produces approximately 5.2 metric tons CO2 on an annual basis. In addition to CO2, automobiles produce methane and N2O from the tailpipe, as well as HFC emissions from leaking air conditioners. CO2 accounts for about 95 percent of vehicle emissions, while the other three gases make up about 5 percent. When accounting for these additional GHGs, the EPA estimates that the average passenger vehicle produces about 5.5 metric tons CO2e per year—more than double the level of emissions associated with a BEV in Maryland. Integrating PEV charging into the electric grid comes with both costs and benefits. As PEV charging will be mainly conducted at the distribution level, this is where impacts will first be seen. From a kW standpoint, a PEV represents approximately half the load of a typical home. However, charging can be managed and shifted to night-time hours when overall loads are lowest (i.e., during off-peak hours), especially with the increasing deployment of smart grid components and two-way communications. Additionally, AMI-enabled dynamic rate structures in Maryland can provide economic incentives for PEV owners to charge their vehicles during non-peak hours. Such incentives could allow a significant level of PEVs to charge simultaneously without requiring any upgrades to the existing generation and transmission systems. Transmission system impacts will likely be minor until PEV penetration reaches a relatively high level (25 million PEVs in PJM would be about 45 percent of the total vehicle fleet). Transmission and generation are constructed to meet peak-level demands, and therefore, during non-peak periods, considerable amounts of transmission and generation capacity sit idle. Excess transmission and generation capacity is especially available during the lowest-load night-time periods. This means that with managed charging that shifts the majority of the PEV load to night-time hours, there is ample existing capacity to meet foreseeable PEV demand. With managed charging, PEVs present many potential benefits to grid operations and also to PEV owners. For example, a fleet of PEV vehicles could provide additional reliability to the grid, while earning a stable stream of revenue for vehicle owners. Fleet vehicles are ideal candidates for providing large-scale services to the grid, because they have the advantage of predictable and schedulable usage. PEVs have the capability of both receiving and discharging electricity from their batteries, so the battery storage capacity of a large fleet can offer valuable services to a grid in the same manner as other electricity storage technologies. On-peak power supply Storage technology can be relied upon to provide electric power at times of high demand. For example, pumped hydroelectric (or pumped storage) entails pumping water up into a reservoir during periods when the demand for electric power (and hence price) is low and using that water to generate electricity when demand (and price) is high. Electric grid support  Storage can help support the transmission system by correcting for transient voltage anomalies. Additionally, storage can be used to help relieve transmission congestion and to relieve pressure on the local distribution system when periods of high, localized demand occur. Use of storage in this way can postpone the need to upgrade electric distribution facilities to accommodate those periods of high demand that occur only infrequently. End-user cost management  An end-user can benefit from energy storage by storing electric power during periods when market prices are low and drawing on that power when market prices are higher. End-user reliability enhancement  Electric storage can be relied upon for power supply during times when the electric grid is not available. Intermittent renewable energy generation support  Electric storage can be used to reduce the intermittency of certain renewable electric generation technologies, such as wind and solar. For example, storage could be used to reduce the output fluctuations from a photovoltaic array due to passing clouds. Furthermore, storage can enhance the value of intermittent renewable energy production by effectively allowing generation produced in one-time period to be carried to a later time period when electricity prices are higher. Presently, only pumped hydroelectric and CAES can be effectively used to provide bulk energy services since these technologies can be sized at 100 MW or more and are capable of providing electric power to the grid for periods measured in hours rather than in minutes or seconds. Bulk energy service refers to: (a) the ability to significantly shift large amounts of energy between the time of generation and the time of use, and (b) the provision of generation capacity. Battery systems and flywheels are better suited to providing transmission and distribution system grid support due to typical size and operational factors and can also be used to provide power quality and reliability at the end-use (retail) level. The widespread use of storage technology has been adversely affected by the relatively high cost of storage. Decreases in the prices of storage devices, particularly lithium ion battery storage which has benefited from research and development related to plug-in electric vehicles, have been significant in recent years and prices are generally expected to continue to decline over time. Based on the potential uses of storage, electric storage can be viewed, to some degree, as a substitute for certain types of generation (e.g., peaking generation) and for certain marginal investments in the distribution and transmission infrastructure. A microgrid is defined as a group of interconnected loads and distributed energy resources, with clear electrical boundaries, that can be connected to the grid or disconnected from the grid to operate in an island-mode. Interest in the development of microgrids has grown significantly over the last five years due to major storms and resulting outages, which sometimes were of prolonged duration. The ability to island a microgrid during an outage is appealing, especially to critical community assets, such as hospitals, community centers, and emergency service complexes. Microgrids utiltize distributed energy resources (DERs) including, but not limited to wind, solar, energy storage, and combined heat and power as energy sources when islanding. The various types of generation that may power a microgrid are detailed in Figure 5-21. Source: “Microgrids 101,” NYSERDA, http://www.nyserda.ny.gov/All-Programs/Programs/NY-Prize/Microgrids-101. Customer microgrids (or true microgrids) are self-governed, and are usually downstream of a single point of common coupling, which allows for the customer to have control of its power system from its side of the meter. Utility or community microgrids (or milligrids) vary from customer microgrids as it will involve a segment of the regulated grid, which require the microgrid to comply with utility regulations. Virtual microgrids include distributed energy resources at multiple sites that can be coordinated to be operated as either a controlled island or multiple islands. Remote power systems operate in island mode only, as they are not grid-connected but involve similar power systems as microgrids. 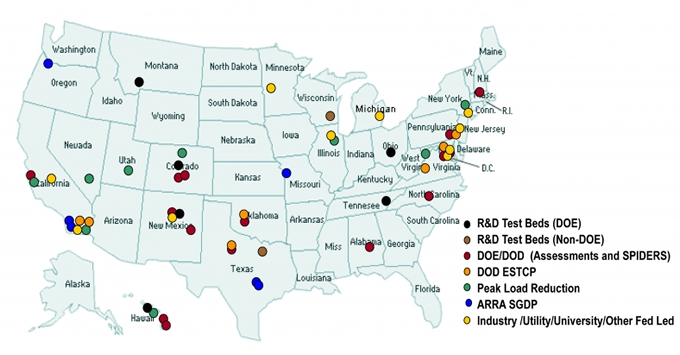 Research, development, and deployment of microgrid systems are occurring throughout the United States, as identified in Figure 5-22. 2 Definitions for map legend. SPIDERS  Smart Power Infrastructure Demonstration for Energy Reliability and Security. DOD ESTCP  Environmental Security Technology Certification Program. ARRA SGDP  American Recovery and Reinvestment Act Smart Grid Demonstration Program. Campus-style microgrids have been in operation for several years in locations such as college campuses, hospitals, military installations, and federal facilities; however, these tend to be customer microgrids. In 2014, the Maryland Resiliency Through Microgrids Task Force was convened to focus on developing a roadmap, as well as removal of barriers, for the development of public purpose microgrids that incorporate critical community assets and cross public rights-of-way. In December 2015, in response to the Task Force’s report, BGE filed for approval of its public purpose microgrid pilot program with the Maryland Public Service Commission. For its pilot program, BGE proposed two microgrid projects. The first project is a 3-MW microgrid in Edmonson Village in Baltimore City, which would incorporate a library and high school which could serve as shelters, and is projected to cost $9.2 million. The second project is a 2-MW microgrid at King’s Contrivance Village Center in Howard County, projected to cost approximately $7 million. Both sites serve as mixed purpose use and the pilots would rely on natural gas as the preferred fuel source, as well as incorporate customer-owned renewable energy. The design and development of the microgrid pilot projects are expected to be completed within 12 to 18 months following PSC approval. In July 2016, the PSC issued Order No. 87669 denying, without prejudice, BGE’s proposal on the basis that the proposal was deficient and was not in the public’s interest, specifically siting BGE’s site selection process, cost recovery, and ratepayers. In its Order, the PSC recommended that BGE resubmit a microgrid pilot proposal for one or two public purpose microgrids. As of April 2016, there were 403 public electric vehicle charging stations throughout Maryland that offered a total of 904 charging outlets. The build-out of charging stations throughout the State has been assisted by the Maryland Energy Administration’s Electric Vehicle Infrastructure Program’s Fast Charger grants and the Maryland Transportation Authority’s (MTA) inclusion of charging stations at Maryland rail stations such as MARC, Metro, and light rail. 12,000 miles per year is the baseline used by the EPA to estimate the greenhouse gas emissions from a typical passenger vehicle. See Union of Concerned Scientists, State of Charge 2012, September 2014, Table AZ and page 17 of the Technical Appendix. As of December 2015, there were approximately 2,300 PEVs registered in Maryland, representing approximately 0.1 percent of Maryland’s registered vehicles. (Source: Campbell, Colin, “Electric Car Excitement Remains Limited in Maryland,” Baltimore Sun, April 19, 2016 (for number of PEVs registered in the state) and http://www.statista.com/statistics/196010/total-number-of-registered-automobiles-in-the-us-by-state. (number of total vehicles in Maryland). 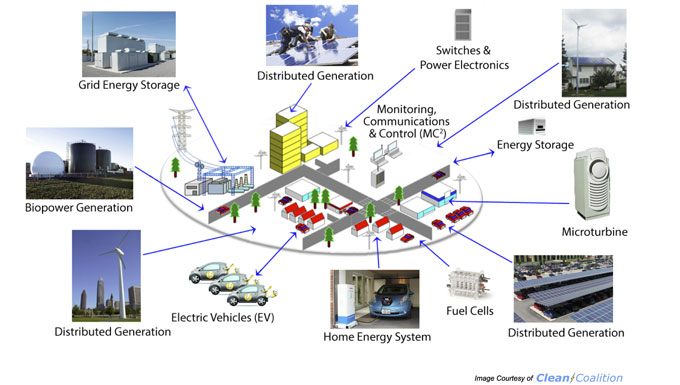 “Types of Microgrids,” Microgrids at Berkeley Lab, https://building-microgrid.lbl.gov/types-microgrids. “Maryland Resiliency Through Microgrids Task Force Report,” June 2014. Resiliency Through Microgrids Task Force. Maryland Public Service Commission Mail Log number 180913.